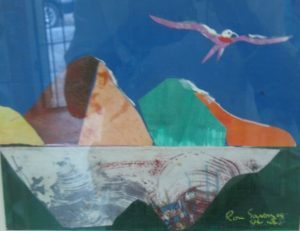 The death has occurred of Ron Savory, the Guyanese artist long resident in Saint Lucia. According to family members he had been ailing for a while, though still up and about. He died on Monday morning. I last saw him, not that long ago, as we waved at each other going in and out of a supermarket. Ron was “one of the great ones” of Guyana art alongside Aubrey Williams, Denis Williams, Stanley Greaves and others. He was contemporary with the leading writers of that generation Wilson Harris, Martin Carter, Ian McDonald, A J Seymour and others as well as theatre persons like Clairmonte Taitt, Ken Corsbie, Marc Mattthews. An “extraordinary generation” indeed. He had also worked in Guyanese radio. As a younger writer, I got to know many of these artists because they were clear in their commitment to the Caribbean as home-space to us, no matter what parish of island or continent we came from. They inspired me as they did many of my own age-group of writers, artists, theatre persons. I am looking forward to tributes from those who knew Ron in those Guyana years, tributes that will place him clearly in the Guyana art and intellectual context. I knew him from his first days in St. Lucia, sometime in the 70’s, helped him set up exhibitions and met him often at his studio and at exhibitions of other artists. He was always passionate about Caribbean politics, history, the arts. I remember he was an enthusiastic promoter of Ivan Sertima’s book “They came before Columbus” and ordered copies that he could sell or pass on to friends. He did not have any high profile in Saint Lucia. He was known and respected by fellow St. Lucian writers and artists; his studio also served as a framing shop for many St. Lucians who wanted art and photographs framed. He worked away steadily and quietly over the years, transposing, I thought, his memory of Guyanese landscapes and forests and interiors, on his appreciation and crafting of St. Lucian banana fields, the mountains, sea birds, the Caribbean sea, masquerade characters, architectural vernacular, petroglyphs. Along with other forms he worked much with a collage style. Sorry to hear about Ron death. I run into him at his shop when I was looking to frame a Cuban painting over fifteen years ago. Ron was chatty as he learnt that I was a former police instructor. A very affable gentlemen who was very principled. I wish his family strength and peace at this time. I offer my sincere condolences to the artistic family in St Lucia – Mr Savory was my favourite artist and mentor in the artistic community. I loved chatting with him (not much on the politics side – that’s another story! ), and exchanging ideas and wit. A lot of people found him “sour”, but he had a sharp and easy wit, which I enjoyed. I shall miss him, and I feel VERY privileged to have met him on friendly terms. I always used to tell him: “one day I shall own a Ron Savory!” to which he would laugh and tell me to choose one of his small paintings – I never did. To me, Ron was a Master, one of the greatest painters to come out of the Caribbean. It always saddened me to see such an amazing talent remain undiscovered by the world. He was a great friend and I will miss him deeply.